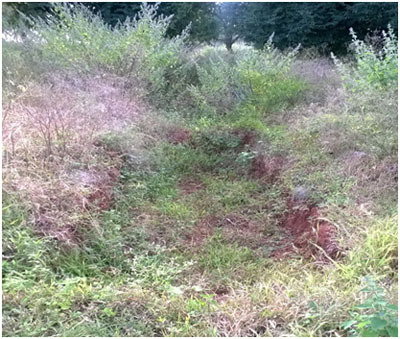 This case study intents to study the effects and impacts on people and their lifestyle after HUVF NABARD watershed intervention at Gunderi Kavalu. The subject to be studied is a family which has undertaken watershed developments related work in their farm and have had a time window to appreciate or criticize its benefits. The subject so chosen is Mr Omkarappa survey no. 37/1 & 36. His wife is a member in Sri. Darideepa SAG. 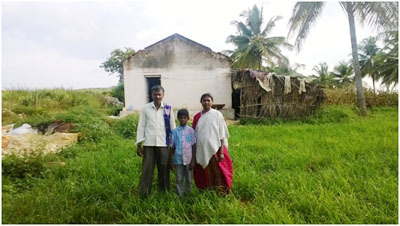 The family belongs to Holalkere taluka, Chitradurga District, Karnataka. Maize is a semi-arid crop & is commonly found in plots in & around Gunderi Kavalu. The agriculture land is mainly rain fed. The fields are ploughed using tractors & bullock carts & sowing involves around 11 to 14 workers/acre. Fertilizers & Pesticides are used as per the requirement. 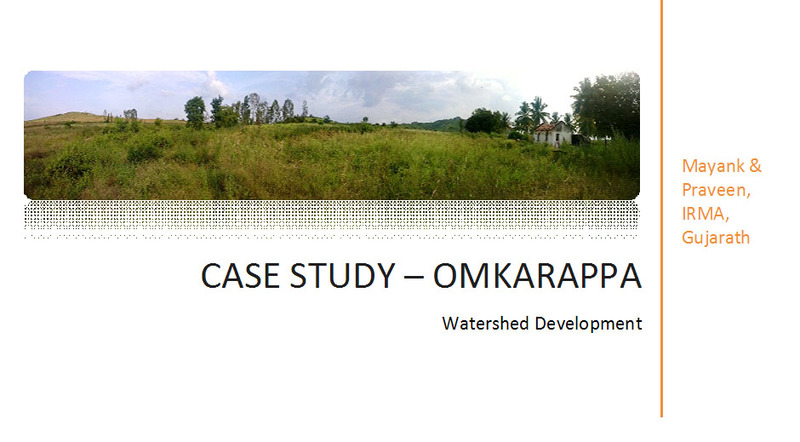 Gunderi Kavalu watershed basin is developed, financed & implemented by NABARD & HVF with anchoring support of Myrada. The scheme involves creating Macro & Micro water-shed basins in the designated area. Micro level basins at farm level includes field bunds, waste weir, hemanta sowing and bund plantation and agro forestry. In this scheme 85% of the funds are provided as subsidy by HUF,NABARD and the rest 15% is borne by the land owner. Myrada also provides necessary exposure to increase awareness among people on benefits of water shed development.This project was started inGunderi Kavalu around March 2012, where in Myradahad introduced it through SHG’s and Federations. Appropriate exposure where given to people by taking them to farms at BAIF Tumkur & IWMP, Andrapradesh. The decision to implement watershed was taken by Mr Omkarappa and family due to the benefits portrayed & the faith which the family had in Myrada and its programs. 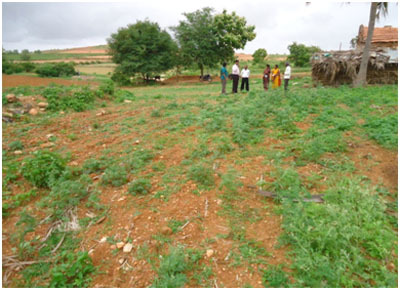 The Bunding work and waste weir work was implemented in the month of may and june 2012 at their farm. And farm pond constructed around the low lying area of the plot. Mr.Onkarappa land is in upper reaches. When the rain came his land to wash away the top layer of the soil leading and loss of fertility & gully formation. Soil also lost its pH & became saline. With the same Agriculture practices yield was – Maze 10 quintals/acre & Ragi ~3.5 quintals/acre; labour required was around 14 per acre. 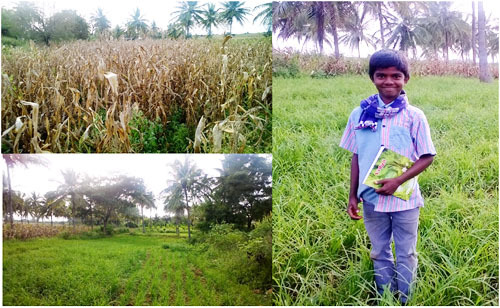 The yield increased from 10 quintal of Maize per acre to 15 quintals/acre, ~3.5 quintals of Ragi per acre to ~4.5 quintals/acre for the same farming method (i.e. using the same seeds, fertilizers and levels of mechanization). Amount of labour required decreased from 14 per acre to 11 per acre. A substantial improvement is seen in the quality of Areca Nut produced. 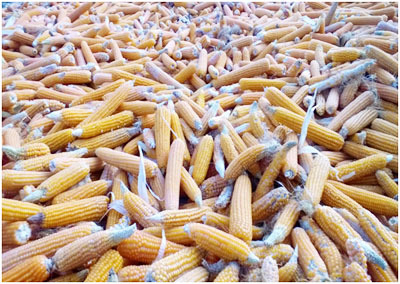 Increased yield of maize also results in additional fodder generation for cattle. This change has enhanced their comfort level for a better lifestyle, gave their children better educational opportunities and also increased their asset base. Mr Omkarappa & family feel benefited from the above intervention portraying a high satisfaction level & increased aspiration for their future. The family now plans to implement drip irrigation, buy a new pump set (Bore well) & start Mango tree plantation. 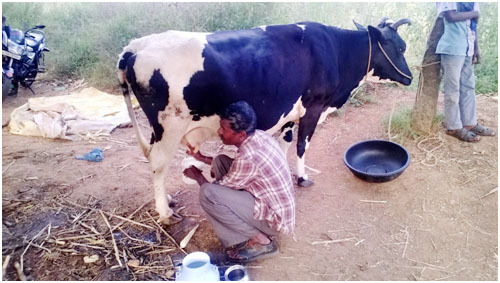 Thereby utilizing the recharged ground water potential and also investing their savings in increasing income.